The first rule when writing opinion pieces is: don't be boring. Judging by its content and the reaction it has provoked, the anonymous op-ed by a senior White House official published by the New York Times has passed this test. But has it passed the test justifying anonymity? Journalists grant anonymity to sources on two grounds: first, to protect them; second, because there is an editorial justification for conveying their views. This applies to news reports and opinion pieces alike. 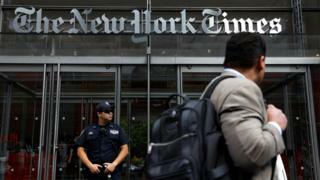 Many US newspapers obey a church and state approach to news and opinion, in which the editors of news pages at the New York Times don't know what is going to be in the opinion pages. This is done for high-minded reasons, though it strikes many journalists in other countries, such as Britain, as naïve, ludicrous, undesirable and impractical. Does 'lodestar' guide us to Trump author? Even if there is a separation between the news and opinion pages, the approach to anonymity is informed by those same two principles: protection of sources, and editorial justification. A reporter could have used the words in the op-ed to inform a news story; but sometimes there is so much the source wants to say that presenting it in op-ed form is better. Wrapping it in a news story doesn't necessarily add much. This begins to address one of the criticisms made of the article. In the Washington Post, which has this week been carrying the reporting from inside the White House of its associate editor Bob Woodward, Erik Wemple argues that reporters have been getting this kind of detail from sources regularly since Trump's election. Therefore, Wemple says, the op-ed has "not a lot of news value". That is a bad call. As Wemple goes on to say, undermining his argument, the section of the op-ed in which this senior official says members of Trump's cabinet have discussed mechanisms for removing him is clearly of tremendous interest, even if it is just confirmation of something that has been known. The fact that the "early whispers" referred to by the author are not made explicit isn't a problem. Perhaps we'll find out more about them. Just getting a whisper of these whispers is good enough. Wemple suggests that the New York Times editors may have "missed the approximately 10,000 quotes from anonymous administration officials raising questions about Trump's capabilities". This sarcasm misses the point: readers of the New York Times may indeed have missed that. For the likes of Wemple, a media critic, news about Trump has come in a hourly deluge. For many newspaper readers and subscribers, their daily dip into a paper means they will not necessarily be aware of the 10,000 quotes that Wemple, luckily for him, has had the chance to see. Another criticism made by Wemple is that this is "a PR stunt". Is it? And if it provided positive publicity for the New York Times, so what? There is nothing innately wrong with opinion pieces making a noise and raising the profile of a particular organ. It would only be a stunt, in the pejorative sense of that word, if the sole purpose was to boost that organ's brand. That's not the case here. A more intriguing argument is that made by David Frum in The Atlantic. He says that the author of the op-ed has provoked a "constitutional crisis". They have "throw[n] the government of the United States into even more dangerous turmoil. He or she has enflamed the paranoia of the president and empowered the president's wilfulness". 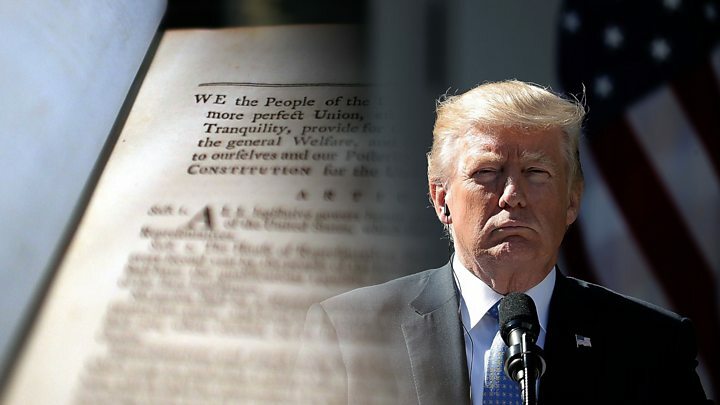 President Trump himself has accused the author of cowardice. 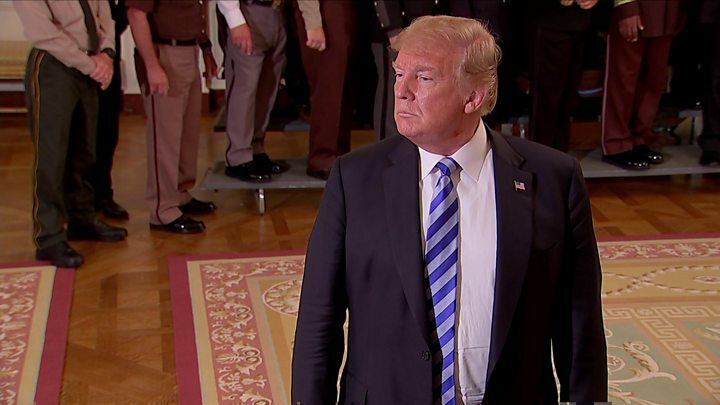 Media captionTrump calls senior official's anonymous editorial "gutless"
But nobody should conflate the journalistic motivation of the New York Times with either the personal morality of the individual or the political duty of White House officials. A newspaper's job isn't to deny cowards a platform, or make sure a department of government functions well. It is to find things out, analyse them, and inform the citizenry, the better to conduct a democracy. The author of this op-ed may be a coward. The White House may now be marginally closer to full-blown crisis, though for now, I doubt it's any worse than after the publication of Michael Wolff's Fire and Fury. The questions for the New York Times are: has this taken the story on, aided our understanding of the Trump administration, and given readers useful information? Yes, yes, and yes. Has it undermined reporters? Is it a mere PR stunt? And is it boring? No, no, and no. "Publish and be damned," said Wellington, in 1824 - but the principle is timeless. If you're interested in issues such as these, please follow me on Twitter or Facebook; and also please subscribe to The Media Show podcast from Radio 4. I'm grateful for all constructive feedback. Thanks.